While “going to the dentist” probably doesn’t show up on most people’s favorite activities list, Dr. Kornegay and his staff at Dr. J. Randall Kornegay Dentistry in Prattville enjoy taking care of teeth, and they have created a relaxed environment to make your visit as easy and pleasant as possible. Dr. James Randall Kornegay DMD has lived in Alabama all of his life. He graduated from the University of Alabama with a B.S. degree in chemistry and a minor in biology. 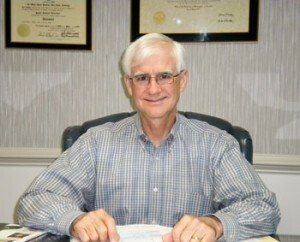 He graduated from the University of Alabama, Birmingham Dental School in 1973 and has been practicing general, cosmetic and reconstructive dentistry in the River Region ever since. He and his staff moved from their Millbrook office to their present location in Prattville in 1991. He is a lifetime member of Kiwanis Club and has served several terms as President of the Millbrook Kiwanis Club as well as being recognized as an outstanding Lt. Governor of Alabama Kiwanis. He has been a member of the American Dental Association, Alabama Dental Association and Second District Dental Society since graduating dental school. He and his wife Barbara have three grown sons. When he’s not working to keep smiles healthy and bright, Dr. Kornegay enjoys travel, boating and vintage car racing. The surest proof of Dr. Kornegay’s commitment to quality dental care can be found in the compliments he and his staff receive from patients, some who have been trusting him with their and their family’s oral health for many years. Dr. Kornegay and his office were named “Outstanding Dentist in Autauga and Elmore counties” in 2008 by The Montgomery Advertiser Readers’ Choice Awards. Monday-Thursday, 8a.m. – 5 p.m.
Closed 12p.m. – 1 p.m. for lunch each day. Most emergencies accepted and seen the same day. Notice to website viewers: This information is provided for information and educational purposes only. No doctor/patient relationship is established by your use of this site. No diagnosis or treatment is being provided. The information contained herein should be used in consultation with the doctor. No guarantees or warranties are made regarding any of the information contained within this website. This website is not intended to offer specific medical, dental or surgical advice to anyone. Further, this website and Dr. Kornegay take no responsibility for websites hyperlinked to this site and such hyper-linking does not imply any relationship with or endorsements of the linked sites. © 2019 Dr. J. Randall Kornegay Dentistry. Designed by Carter Photography & Design.